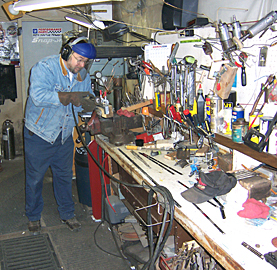 Over the past 21 years, I have been a master fabricator of classic Nomad stainless steel trim components. Presently I deal with these distributors which currently stock all the custom parts that are available. If you are interested in other custom stainless fabricated parts, please do not hesitate to contact me. As a Nomad owner and fanatic, I decided to create custom after market parts after restoring my own Nomad in the early 1980s. The interior trim of my car was banged up, a dented mess. Since new parts weren't available and junk yard parts weren't any better than what I already had, I decided to fabricate my own. The finished product turned out so well, I decided to start a side business 19 years ago and I never looked back. Over the years, I expanded into trim accessories for the 1950s Pontiac Safari wagon and I plan to make similar pars for the 1965-69 Ford Mustang fastback. My brother Gene gave me the inspiration to get into this. He said 'you ought to get into this and carve out a little niche.' after seeing what I did with my car. It's a hobby and a passion that turned into a side business. My business resources help my hobby expand, which in turn helped my side business. 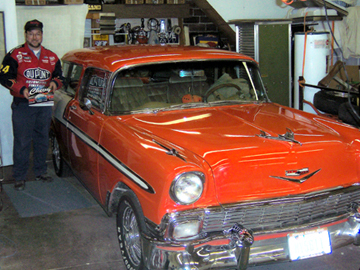 My passion is a 1956 orange and white Nomad, meticulously restored to its original condition, with a few modifications, such as a larger 327 cubic-inch power plant and a brown cloth interior. A slide-out tissue holder in the passenger front seat, and option when new, will eventually be turned into a place for a compact disk player. he five-year restoration project began in 1980. Of the 25,000 Nomads built, his model came factory air-conditioning that cost $3,300 new. He said only 2,000 of his model were made. People who are restoring cares need a lot of patience, I am currently rebuilding a 1939 Chevy. Trying to find that body shop or upholstery shop (with the knowledge of a particular car) with trained personnel can be very difficult. I forgot how much of a headache it was to restore a car. That's why customer service is an important part of my business. 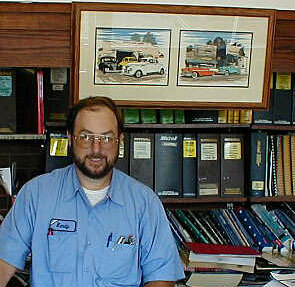 It's not uncommon for Nomad lovers to call the shop for installation advice and other tidbits about the car. I generally keep five kits in stock. The replacement parts has been a good asset to my company. When things are slow in the winter, this market picks up, so that's been helpful to me. Nostalgia seems to be the reason behind sinking thousands of dollars into bringing back rusting hulks of cars like the Nomad back to life. 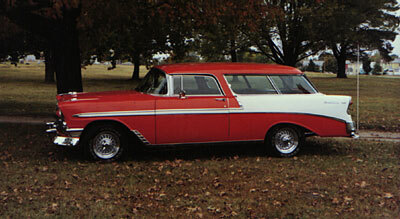 My family did not own a Nomad when I was growing up, but I can remember being crammed into the back of my father's 1959 Pontiac station wagon with the rest of the family's gear during vacations or to go to the Mississippi River for a picnic. No matter how hot, cold or bumpy the voyage was, he just enjoyed the ride. To me, there's nothing like the feel of a monster wagon rumbling down the road. Or the looks I get from other motorists. I've taken my own family on road trips in the Nomad, to Vail, Colorado and Oklahoma. People like the style of the car, and it fits me.